We’ve all seen it, the car lurching onto the highway with six inches of snow piled on top with nothing but the windshield cleared by a few brisk wiper blade passes. You see the driver carelessly changing lanes with white snow and ice on every window obstructing their view. You find yourself a few short car lengths behind this snow covered monstrosity. It hasn’t happened yet, although you can feel it, the creeping threat of danger enters your thoughts. ‘I should change lanes’. As if by instinct your thoughts immediately turn to action. Then it happens, slowly at first then all at once, the turbulent air swirling around this small mountain of snow and ice begin to tear it from the roof. Chunk by chunk the snow and ice crashes down to the pavement below. You made it. No damage to you or your car. But what if you weren’t so lucky? 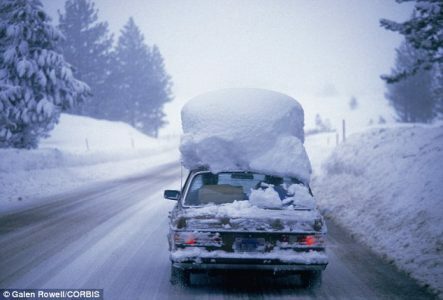 In the state of New Hampshire driving with snow and ice buildup is illegal. In 1999, 20 year old Jessica Smith was killed in an automobile accident caused by a 9 foot slab of ice after it was thrown from an 18 wheeler. This prompted the passing of Jessica’s law which would insure $250-$500 fines for first time offenders and up to $1000 fines and license suspension for up to a year for repeat offenders. Not everyone follows the rules and that means you need to protect yourself. Good news for you is most auto insurance policies will have coverage if you experience this type of impact. Thanks to Jessica’s law, in the state of New Hampshire the driver of the vehicle with the icy roof will be liable for damages falling ice causes to your vehicle. This is typically covered by the liability portion of their coverage, specifically property damage. If for whatever reason the culprit flees the scene, your own auto policy would have coverage for such an incident. Comprehensive coverage would be utilized in this case as a result of a falling object. Not all polices are sufficient to protect you from every danger you face out on the open road. You are always best to consult with your local insurance agent and be sure you are covered from the perils you face while driving!